Hello! Happy Friday! Yay it's Friday! Now that my sweetheart is in full time school I am so happy for the weekend! Although last Saturday she did tell us she wished she had school! And my friends you know we don't just sit around home we have lots of fun doing things, she just really loves school! It's sweet but I do really miss her so you know how it is! We should be able to have lots of fun outside as the weather is still gorgeous! The ribbon stamp is by Stampin Up, some colored embossing adds some interest! This card took no time so I made 3 of them! That's it for me today! Who is excited for tomorrow? I am quite excited for World Card Making Day! Although I probably have created more today than I will get to a chance to tomorrow! :> I am trying to work on being a better blogger. I am quite behind I realized! :> Have a great night I am excited to be heading out for dinner with some great friends! Hello! Hope your having a great week! We are having unseasonal weather, super hot! It's strange how hot it is but I am not complaining. It could snow in October, and no I am not joking! :> We've been enjoying this great weather! Over the weekend we went to a corn maze and the kids loved it! There were farm animals to pet and my kids are so opposite Ariel loves all the animals and would bring them all home while Carter holds onto my legs and says "Mommy I am scared!" Scared of the bunnies? :> Which child do you think takes after me? Carter! I was so scared of animals when I was a kid! I guess your either an animal person or your not! I know the day will come that we will have to get Ariel a pet I think we just have to wait until Carter won't run screaming when it comes near him! I made actually made 2 cards like this, I find when I have a card idea in my head if I just stamp and color everything twice it's not that much extra work to make 2! I colored the butterfly with my prisma pencils and blended it with mineral spirits. Well that it's for me today! Wednesday's are a busier day for us. Ariel has dance tonight, teeny tiny g's (hip hop) and ballet/tap/jazz so an hour and a half of dance! Trying to get a healthy home cooked dinner in, practicing piano with her, her sight words and reading and a decent bedtime in!! But it's also a fun day for me tonight I have a mom's dance class! Her studio offers a free dance class for the mom's of kids taking dance classes. It's super late from 10 to 11 but at the same time I am able to get some relaxation after the kids are in bed before I go to class! I am not the best dancer at all but it's exercise and so close to home too! Hello! Happy Monday! This week I will be sharing Think Pink cards! My local scrapbooking store Scrapbooking by Design is having Think Pink Month. One of the things they are doing this month is collecting cards for A Card for a Survivor, there goal is 150 cards that they would like to hand out at the Canadian Breast Cancer CIBC Run for the Cure walk that takes place this upcoming Sunday October 2nd! My goal is to work on Pink cards all week long and bring them in this Friday! 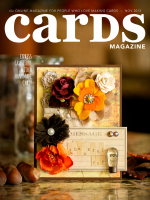 I think that this is a great idea and want to help her reach an surpass her goal of 150 cards! If you would also like to create a card for this and can mail it asap or if you live locally please check out this link here. For me sadly breast cancer has touched someone I love. A few years ago my aunt (my mother's youngest sister) died after her first treatment. My mother, other aunt and uncle didn't make it in time to see her as they were just landing in the airplane (my aunt lived in Croatia) My aunt lived a very hard life living through the war in Croatia (she lived in what was called one of the worst war torn cities in Europe) and after the war losing her husband to a tragic farm accident. Life was just starting to clear up for her. And recently another close family friend has gone out of remission and is undergoing treatment. I am praying for her healing. And I plan to send her a card now and again to let her know that she is in our thoughts and prayers. I used two new stamp sets by Hero Arts the My Happy from there Studio Calico line (got this one with my HA class at Scrapfest!) And Butterflies and Wildflowers from there Basic grey line. I thought this sentiment today is a new day was a good one, thoughts? See you tomorrow with another pink card! Hello! Happy Saturday! It's supposed to be an absolutely beautiful weekend here and we are quite excited! I am here with a new Wee Memories Scrappy Saturday Challenge!! 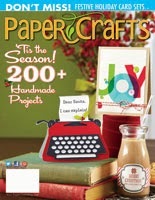 This week our sponsor is the popular Echo Park Paper! Our challenge is "Patterned Paper"! I tend to hoard pattern paper but am finding myself using it A LOT more than I used to! I decided to play with a really girly piece that I had from the Little Girl collection, Chloe's Crown. I had to pair the MFT stamp set Something Special Just for you with it! And I decided to play along with the MFT Get Sketchy challenge, I have never played before but have wanted to! I hope that you will join us this week for the challenge! Please do check out my fellow DT"s always inspiring work at the Wee Memories' Blog here! Hello happy Tuesday! I leave for Scrapfest in 1 day! I am soooo excited! I can't wait to get away with my girlfriends and shop, hit scrapfest, see some crafty friends! Enjoy time away from my wonderful family!! We are so busy I hardly have time to miss them, instead I shop for them, lol!!!! 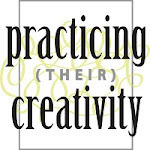 I have some great news, I had two cards picked up for publication in the Create: Stamping Idea Book!!! I can't tell you how happy it makes me! And what a great start to my week! Today I am here with a few cards I made for Grandparents day. I know it's sometime this month but my church celebrated it this past Sunday! Every year it sneaks up on me and I don't have a card for it, and in my hubby's family they exchange cards for this! Luckily I realized on Saturday so I got to work and made 3 simular cards for my parents, hubby's and his nana! I stamped one of the flowers from the Blossom Art set in barn door, wild honey, spiced marmalade Tim Holtz Distress Inks. Than I embossed it in white and did the resist technique with the inks. I used Hero Arts layering papers as my card base. I had a hard time choosing the sentiment and went with this one, it seemed fitting! :> I am entering this card into the Lily Pad Cards Resist Challenge! And into this month's Hero Arts challenge under the fall category! Hello! Happy Saturday! I am here a bit late with my card for the newest Wee Memories Scrappy Saturday challenge, in my defense it was soo hot here today we spent most of the day by a friend's pool! Gotta take advantage of a hot day in September! It's not usually like that here! And last night I came home from a shift at work smashed! :> Back to school week at a kids clothing store is exhausting! This week our sponsor is Wilson Designs! They have such cute stamps! Our challenge is one layer creations! I pulled out just saying hi by Hero Arts and made a fun background with the telephones! When I choose the colors I just pulled out whatever ink pads and I really like my choice! When she came home all she could talk about was how much fun she had at school! She told me that she can't wait to go again! :> That makes me so very happy! I do have a card to share today. I made it last week. Pretty simple but I really enjoyed making it! I embossed the butterflies from the Lauderdale Set by Hero Arts onto patterned paper by My Mind's Eye Lime Twist collection. So love the fun colors! 1 week from today until I leave for Scrapfest! I am so looking forward to Scrapfest! It's my third year going and I have such a great time! Love my girlfriends I travel with and love all my flickr girls I meet up with! :> And so love the shopping! I am looking forward to just having some fun! Hello! Happy Labor Day! It's a holiday Monday here in Canada and we are enjoying it resting at home after a busy weekend at the cabin! The town the cabin is near had a festival this weekend so we enjoyed fireworks, a parade, fun kids activities and a pancake breakfast! My kids really enjoyed all of this with there cousins! It's nice to have most of them close in age! 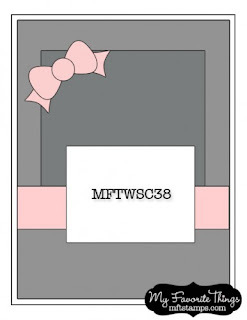 And what a great start to my week to see my back to school card featured at the Twinery Blog today, click here to see it! You know how much I love my twine from the Twinery! Hubby is out of town so it's just me and the kids! He went to the Labor Day Classic an annual football game between us and another city. Sadly even though our team has been doing so much better they lost, and bad calls on behalf of the referees in favor of the other team didn't help! :> He went with two guy friends and they all stayed at Chad's aunt. She loves having company! On Friday night I sat down to make a thank you card for her from the guys and than got quite inspired and made her a little card set! It took my just a bit over an hour! Well I am off to dinner at my parents! Wishing you a great day! Hello! I can't believe it's September already!!! We loved summer over here and I am happy to share that we gave our kids an amazing summer! Here we are at our September long weekend! Hope you have some great plans! As you read this we are spending time with the inlaws and family at the cabin! It's a festival at the town out there so fireworks, a parade and all kinds of fun kids activities! 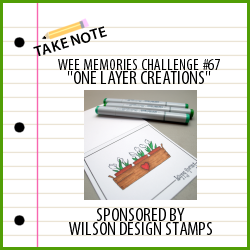 I am here with a new Wee Memories Challenge! It's the first Saturday of the month which means it's our blog hop! You should have arrived here from Amy ! If not please join us and check out Jenny's blog! We have a cool sponsor this week, I Love It All!!!! Our challenge is perfectly fitting for our sponsor, it's Simply Sentiments! I have been feeling a bit out of it with the papercrafting the past few weeks. I think I was just a bit burnt out being busy with the kids and working a 2 evenings a week. I wanted to craft but couldn't really find the time or energy for it. I felt like I didn't have good ideas either. This card brought me back. It's not perfect but I so enjoyed making it and after making it I made a card set (will share later) and now feel back with it! I realized again how much I missed papercrafting and how it's something for me and that's okay I need that! I hope that you will join us this week for this fun challenge! Our winner will receive a $20 gift certificate to the I Love it all etsy store! :> Your next stop along the hop is to Brandi!!! 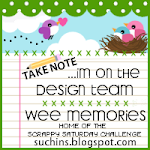 For more info and to link up your creation please head to the Wee Memories blog!